Knowing when to send out your wedding stationery could be tricky. There are lots of "rules of thumbs" out there and etiquette, but every wedding, guest list, and couple are different... how is one to know when the right timing is? I like to approach it by backing out of the wedding date with the understanding of what needs to happen to get there, instead of starting from the beginning. The table to the right is the quick cheatsheet for the formula that I use with my wedding clients. So let’s break down why this works the way it does. The RSVP due date depends on a few things, but is typically 2-3 weeks before the wedding. I always recommend talking to your wedding coordinator and caterer to see when final headcounts are due, as well as allow yourself enough time to figure out the seating chart. And of course, you may need to give yourself some time to track down stragglers if you KNOW that your guests are prone to forgetting things like, I don’t know, letting you know whether they’re coming to the most stressful dinner party of your life (people, right?). This means that in some scenario, you may even need 4-6 weeks before the day to get the RSVPs in. Now that you have the RSVP due date (which will go on your invitation so make sure that’s nailed down!) you want to figure out then in-home delivery date for your wedding invitation. This is one that people tend to forget, but just because you SEND your invitation on a certain date, doesn’t mean all guests are going to receive it on that date. To allow for the post office to deliver, as well as for guests to actually check their mail (I mean, I can tell you right now that I only check my mail like every 3-5 days), account for a week between actually sending and delivering the invitation. So, between the invitation getting into the guests’ hands and the RSVP due date, you should give folks 4 weeks. This tends to be the sweet spot—any longer and guests think, “Oh I have SO MUCH TIME, don’t need to do it now!” but any less and guests can feel overwhelmed by the looming deadline. In other words, the invitation should arrive at folks’ mailboxes 4 weeks before the due date, which means you want them at the post office 5 weeks before the due date. Make sense? Last but not least is the Save the Dates. The rule of thumb here is that when you have a venue and date confirmed, you’re ready to send out these suckers—which usually happen 8-12 months prior to the wedding day. No need to be really structured with this guy, it’s by definition just a heads up. You don’t even need to send to your entire guest list, just folks you couldn’t live without if they weren’t there. And these days, between you and your excited relatives, the word of your date permeates pretty quickly. It could, however, serve as a great “filter” to let members of big families know who should expect an invite and who shouldn’t, so it’s not a surprise later. Extra credit: Are you planning destination wedding? The timeline can shift a bit if you’re planning a destination wedding, or more than half of your guests will be traveling in. Allow more time for both yourself and your guest, because arranging travel could be tough, and you may have to make more calls to see if Grandma from across the country will be able to make the trip over. You can also use this extended timeline if you know your caterer/coordinator needs the RSVP earlier, you’re planning a wedding around the holidays (again, travel is tough), or your wedding invitation send out date falls near a holiday. I mean, look I know that that's not really what you want to hear , but when it comes to invitation enclosure cards it's true. Whether you're looking to design your own or are getting a custom suite designed, understanding the different enclosure cards and the reason behind those sizes could really help out as you go through the design process. So let's break it down, shall we? This one is pretty standard at 5x7 in, and this is pretty much the golden rule. This is because it is the perfect size for making sure all your details can fit onto the card, but still not considered oversized when mailing it out usin ga A7 envelope. You can usually keep it within the weight limit for regular mail, so that you can use standard postage too (Forever Stamps are your friend). 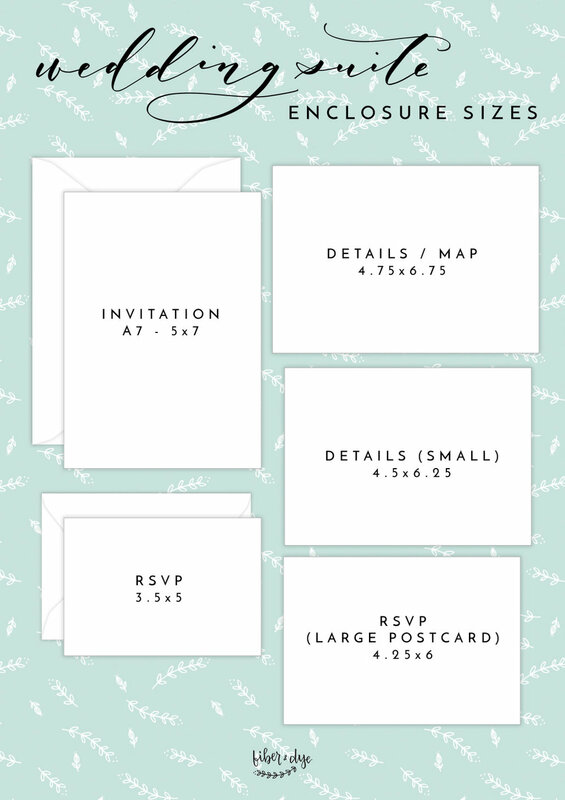 With that said, we've done weddings with a long rectangular invite or a quadfold that was slightly smaller—our suggestion though, is that the reason for deviating from this size should really make a design statement. The different sizing could make things a little more complicated, so it should definitely be worth doing it! The Details card is an important one because this is where you can communicate to guests things like information about your registry, transportation, directions, etc., which would otherwise not fit in the main invitation. If you just simply wanted to list a few details like your website, we would suggest the A6 size, which is 4.5x6.25 in. Since that's a standardized size (notice that it even has a name!) it's a lot easier to find pre-cut paper for those planning on printing yourself, and it's a nice size that really tucks right in when stacked with the main invitation. But say you had a lot of information or planning to do a map, then sizing up to a 4.75x6.75 in would ensure that none of the smaller details would get lost. If you were going the more traditional route with a return envelope enclosed for the RSVP card, the standard is 3.5x5 in since it fits the little 4-bar envelope folks usually use. But this is a rule that we love to break. Have you thought about making your RSVP card into a postcard? This allows you more space to play with, and eliminates the need for an envelope. You can also have additional room to collect information from your guests, like if you were having a weekend wedding with lots of festivities you can get their attendance for every Sunday brunch or Friday night yoga, and even note important guest information like repeating that it's an adult-only reception (a little reminder goes a long way). It also allows you to have fun with the back of the postcard, where you can do a fun design like a quote you both love or ask for more recommendations on song choices, message for the couple, etc. Whether you're going traditional or funky, enclosure sizes are something you may not immediately think about but has a huge impact on the scope of your project. Make sure to ask your designer about size suggestions, or research the paper you want to print on if you're doing it yourself!